Most comic book fans and movie collectors will be getting their copies of “The Avengers” when it hits shelves tomorrow. However, also coming out tomorrow is another superhero movie. 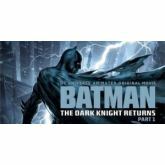 From Warner Bros Home Video comes The Dark Knight Returns Part 1″. The new animated feature is based on 1986 comic that forever changed the name of Batman. In the story, Bruce Wayne has retired his cape and cowl. However, after a ten-year absence, Bruce decides to dawn his dark persona once again in order to defend the streets of Gotham against the likes of the new gang plaguing the city: The Mutants. This animated film features the voice work of Peter Weller as Batman, Ariel Winters as Robin, David Selby as Commissioner Gordon and many other talented voice actors that make for one massive ensemble. Though the film arrives tomorrow, the likes of Superherohype have already seen it and have given the film a very solid review. Also on the superhero movie site is new promotional content for the movie. First is an interview with the young Ariel Winters, who plays Carrie, aka Robin. In the interview, Ariel talks about being the first female Robin as well as what it took for her to fit into the role. Along with the interview is a new clip to the movie featuring none other than Carrie in action as the first Girl Wonder. All of this in the name to get people interested on the animated take on the classic comic book story. So are you interested? Check out the Clip and decide for yourself.